RMA Tolerances - Coi Rubber Products ® Call Now & Let Coi Design it for you! 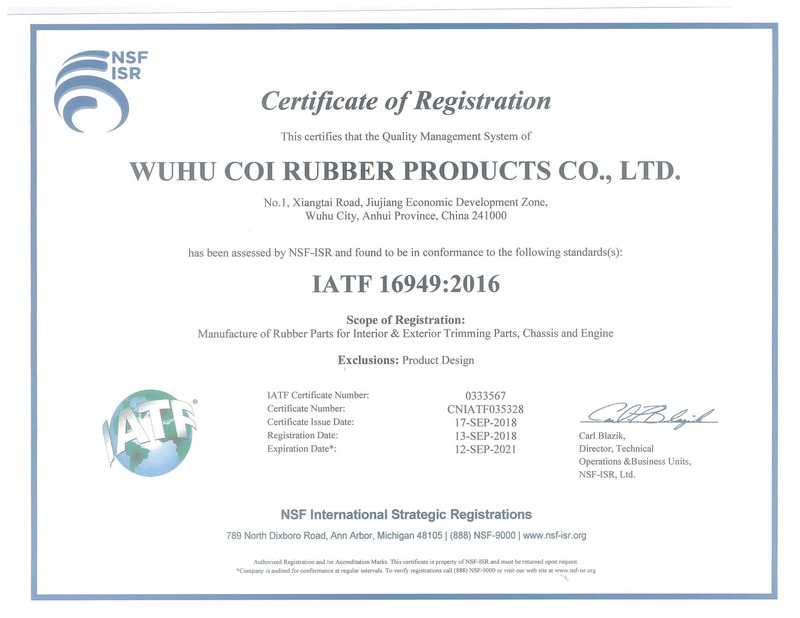 High Precision This is the tightest tolerance classification and indicates a high precision rubber product. Such moldings require precision molds, fewer cavities per mold, close mix controls, etc., which results in high cost. Optical comparators or other measuring devices may be required to minimize distortion of the rubber part by the measuring instrument. This part requires expensive control and inspection procedures. Precision These moldings involve much of the close controls required for the above class. Molds must be precision machined and kept in good repair. While measurement methods may be simpler than the above class, careful inspection will usually be required. Commercial This class indicates a general grade or commercial product. This is the most commonly used class. Non-critical Molds by this class apply to products were control is non-critical and secondary to cost. Unlike other materials such as metals, alloys, etc, thermoset molded elastomers do not lend themselves well to the same level of tolerances. Due to being thermally molded, elastomers are subject to many variables. Such variables may include temperature, cure time, mold textures, batch variation, compound variation, and shrinkage. These are just some of the tolerance effecting variables found in the manufacturing process of molded rubber. The following RMA Chart provides more information. The Rubber Manufacturers Association (RMA) has developed tolerance tables with ranges to provide communication between quality control and manufacture across a wide range of industries, from precision Aerospace Electronic to open-tolerance products found in everyday consumer goods. These RMA tolerances provide designations and relate to the variability inherent in processing molded rubber parts and are referred to as RMA “A2” Precision and RMA “A3” Commercial Dimensional RMA Tolerance designations. (CTF) Critifcal Function or otherwise know as critical dimensions would override designated general guiding tolerances by RMA. These are flagged dimensions (or geometric tolerances) that are often subdivided into two groups: fit/function and safety. They indicate more than just an inspection dimension; they require variable data to be taken and statistically monitored. This is where other terms like Cpk and six sigma come in. There are obviously costs involved as the rubber molder prepares to meet customer requirements at the RMA “A2” level. This includes preparations for tooling, extra features, cavity finishes, and cavity flow provisions. In processing, very close temperature control and timing of molding cycles may add to the cost of the part. The type of rubber material, and particularly its durometer hardness, will determine if the part will experience substantial size change during its cool down. Very soft rubbers (15 to 30 durometer) will fall in a 3 to 4% shrink category. Firm to almost rigid compounds (65 to 85 durometer) will shrink 1-1/2 to 2%, allowing for tighter tolerances. Shrinkage occurs on all rubber components and is a volume effect. Although built into the mold, it will vary depending on the part complexity within the same cavity. It occurs when the part is removed from the heated mold and allowed to cool. The engineering challenge is to cut a steel cavity that will reliably provide acceptable toleranced rubber parts. Given today’s close tolerance thin cross-section designs, your need for precision molded parts has never been more apparent. Fixed dimension tolerances apply individually to each fixed dimension by its own size. Fixed and closure dimensions for a given table do not necessarily go together, and can be split between tables. Capability studies can be run with a cavity segment to aid our efforts in assigning tolerances for a given material. Please contact us for assistance. What are the typically tolerances that are used within the mold rubber arena? Most applications will be sufficient within the RMA A2-A3 where commercial tolerances are applied to specific dimension or prints entirety. Sometimes a specific or set of dimensions are considered critical. This is often denoted by a diamond, oval, or asterisk. A CTF, or critical to failure dimension would be denoted to be used in form fit or function. Typically these would supersede a normal tolerance be found within the RMA A2 or even A1. When rma tolerances are in the RMA A1 or even greater, then calibration and tolerance in which equipment is confined to will be just as equally important. The factors in which effects a tolerance, or the variance factor in controlling tolerances are effected by, not limited to: compound, durometer, age of press, press size, number of cavities, operator, geometric complication of the part, number of geometrical measurements, etc. When going being A1, you may be within the 50-150 microns level of measurements. In these kinds of measurements, your calibration equipment tolerance should be within 10% tolerance of the number of microns in which you are trying to keep within tolerance. For example, if you have 150 microns of tolerance, you’re device, calibrate date and certification should not have a variance of more than 15 microns. We’re now in a level of accuracy in which non contact CMM devices must be used. Typically a white light, laser, or even microscopic device can be utilized to ensure accuracy. Doing this will allow replication across the globe in any lab setting and allow your quality control goals to be achieved. Contact your Coi Rubber sales engineer if you have any other questions. Do not over engineer unnecessary cost into your part. Discuss with us where the application is used and allow our experts to help you reduce cost while making sure that your parts are properly tolerance the right way from the start! Contact Us for further assistance with dimensional tolerances for rubber molded components.